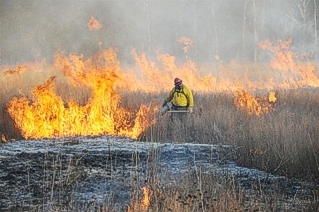 The prescribed burn of the X-611A prairie vegetation over the former lime sludge lagoons is required by DOE every five years to help maintain a prairie ecosystem. 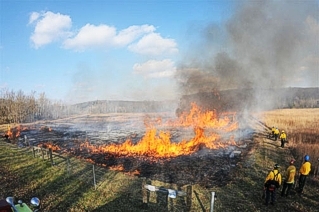 PIKETON, Ohio – December 19, 2011 -- Six PORTS Fire Services firefighters conducted a prescribed burn of the grasses of the X-611A Prairie, the former lime sludge lagoons, Sunday afternoon, Dec. 18. Several other personnel were on hand to assist and provide required support. The soil and vegetative cover system consists of a minimum 2-foot-thick soil layer covering a reinforcement geo¬textile fabric that was placed over the sludge. The soil layer was designed to support a prairie vegetation ground cover about four feet high. The Northeast Bypass Road was closed during the activity, which had to be postponed from a Thursday, Dec. 15 date due to rain. Area service agencies and residents were notified of the burn, but no outside assistance was needed during the December 18 activities.